We are a New York State Certified ambulance service that provides both basic life support (BLS) and paramedic level care (ALS). NWVAC operates four ambulances, three paramedic first response vehicles, one BLS first response vehicle and one special operations unit. NWVAC is the official ambulance service for the Town of New Windsor, NY. It operates out of its headquarters at 555 Union Avenue in New Windsor. NWVAC covers 35.99 square miles of territory, including part of Stewart International Airport. Over 30,000 people rely on their service and depend on them to be available 24/7. It is one of the busiest ambulance services in Orange County, answering over 3,200 calls in 2017. NWVAC has one of the best response times in the industry. 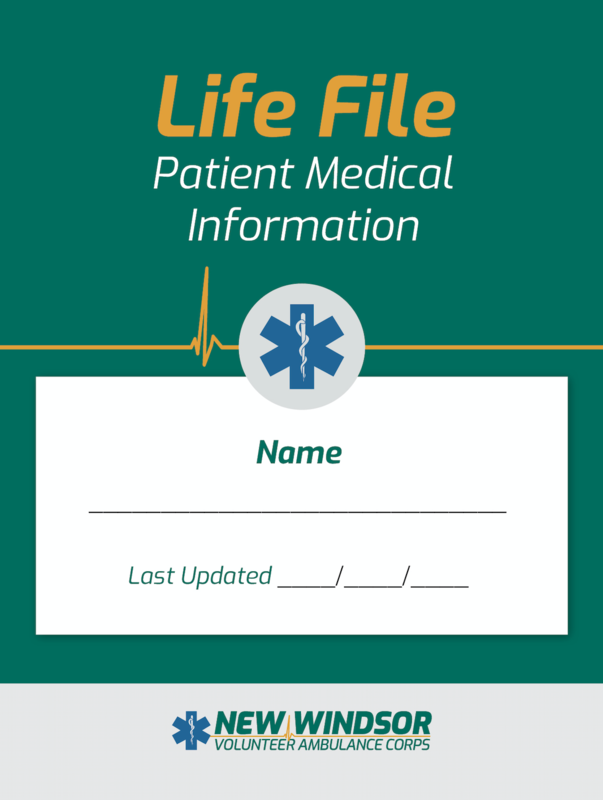 Introducing the New Windsor EMS Life File: a small booklet that collects all of the important information we need to know to best assist you in a crisis. Download, print, and fill out this booklet to help us better understand your individual health needs.